Ying Mais a Professor of Economics at School of Economics and Management, Wuhan University. He is also the Deputy Director of the Center for Economic Development Research (CEDR), Wuhan University. He was a Visiting Scholar to Harvard University from August 1991 to October 1992 and again from August 1999 to August 2000. He was given a six-month fellowship under the EU-China Higher Education Cooperation Programme to conduct research in Universite de Marne-la-vallee. His research interests include business cycles in developed countries, fiscal transfers as regional policy tools in Germany and the EU, thoughts of the German Historical School on economic development and fundamental theories and methodology of the structuralist approach to development economics. 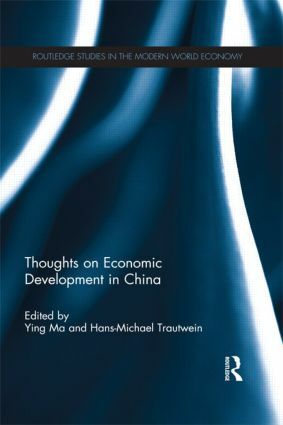 Hans-Michael Trautweinis Professor of International Economics and the China Commissioner at the University of Oldenburg. He is also director of the Center for Transnational Studies (ZenTra) of the Universities of Bremen and Oldenburg. His research interests include the transnationalisation of finance and production, monetary integration and economic development, comparative evaluations of modern and older approaches to monetary macroeconomics, and the history of economic thought. He has been visiting professor at Wuhan University and at various universities and research institutes in Europe and South America.